Energy Medicine for Life | Awakening the Wisdom of Your Inner Healer. For some of us, negative thinking creeps in through our cracks, and we find ourselves IN IT, deeper than we thought. It looks different from time to time, person to person, but it is whatever is draining us … overwhelm about our health or work or inner life or our physical homes, concern about country and planet, fear about the present and the future, frustration about what we cannot shift, panic because it feels like too much to handle, ongoing worry that saps us slowly away, grief and resignation for things gone, or gone too far… these can become inner states that lock us out of a way forward, sunken and stuck. And we have ways to focus our actions, which at first can feel like wrestling the steering wheel with all our might, to get the truck up out of the ditch and back onto smooth pavement, and move forward. Here are two Energy Medicine Tools from Donna Eden – first, to shift your energies out of a stuck (homolateral) pattern and into movement and communication (cross-lateral) where possibilities can again appear … possible. And the second one, to generate both peace in the present moment, and momentum to take appropriate actions and move towards what we really want. Place your hands on the tops of your thighs and take three deep and relaxing breaths. Rub your hands briskly together and shake them. Place right hand on the muscles between your neck and shoulder on your left side. Squeeze and massage those muscles a few times, inhale, and on your exhale drag the palm of your hand from left shoulder to right hip with firm pressure. Repeat from the right shoulder, using your left hand. Alternate this tracing gesture 3 or 4 times with slow and deliberate motions. Nine Hearts Next, we can use the healing and energizing influence of our hands to activate a potential of joy, healing and positivity that is resting within us. Our life force responds to this pattern of flow, movement and direction when we move our hands with mindful and kind intent. We wake up our own innate power that is waiting to bring us to our peace, to the action that is ours to take, and to hope. Here is Prune Harris showing you how to do this simple exercise in a beautiful way and in a lovely place. You are unique and wonderfully designed, with energy patterns and a history different from everyone else on the planet. It is my privilege to communicate with the subtle energies that make up an individual’s state of being, and to bring my expertise to bear in helping each client restore the effectiveness of their inner healing forces, and move into greater wellness in every aspect of their lives. My work is effective by phone, Skype or in person. I look forward to serving you. © Lyn Milum and Energy Medicine for Life, ™ 2016. Contact Lyn to bring Energy Medicine classes and workshops to your group! The year turns, and we move from an equal measure of sunlight and night, towards the increase of the dark, the introspective, the inner experience. In Chinese medicine, the element of this season is Metal, the associated meridian channels and organs are the Lungs and Large Intestine, the emotions include grief and loss, and the theme is to sift and sort through our experiences, our beliefs, our habits, our possessions … to keep whatever has true value and meaning, and to Let Go of everything else. 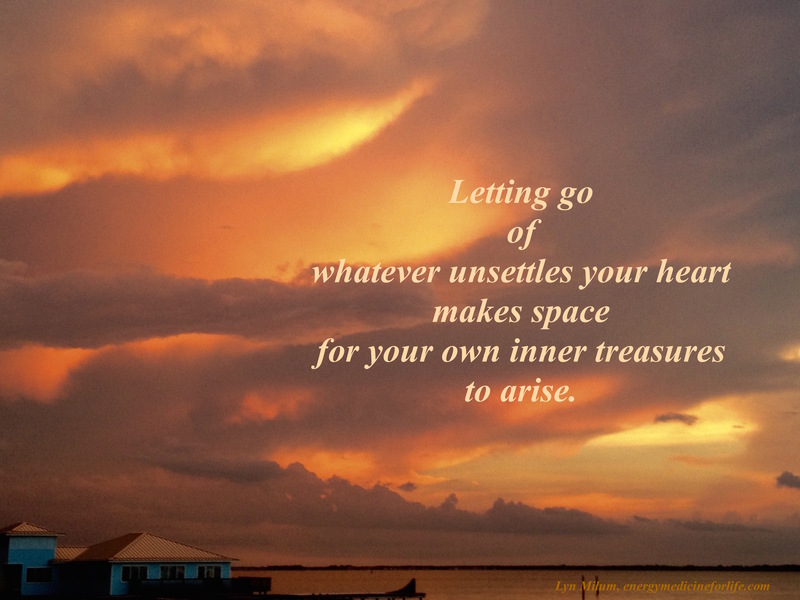 Letting Go Exercise: Success and happiness require you to let go of your unworthiness, to let go of your wounds, to let go of your defenses, to let go of your story and to let go of your ego. The more you let go, the more you inhabit your authentic, unconditioned self again. And now you are more present, more connected, more open and more able to give yourself without giving yourself away. The more grounded and centered you are in the truth of who you are, the better you understand that to give yourself simply means to be yourself, and in “being” there is never any loss. Wishing you ease in your letting go of whatever no longer serves your light, and deep inspirations of clean, crisp fall air. You are a wonderfully made and unique individual, with energy patterns and a history different from everyone else on the planet. It is my privilege to communicate with the subtle energies that make up an individual’s condition, and to bring my expertise to bear in helping each client restore the effectiveness of their inner healing forces, and move into greater wellness. My work is effective by phone, Skype or in person. I look forward to serving you. © Lyn Milum and Energy Medicine for Life, ™ 2015. Recently I was able to take a couple of days at the beach to decompress after a time of hardship. The soft winds seemed to flow straight through my body and leave me feeling renewed, hopeful again. Nature freely absorbs the congested, stuck, painful energies, and offers restoration and rejuvenation. It is always there, always generous, grounding static anxious energies and helping us return to simplicity. Energy Medicine makes use of the healing forces of the hands, the vibrant imagination, and the amazing intelligence of the body that knows how to heal and restore us. A simple practice is to put one hand on the center of your chest, and cover it with your other hand. Relax your shoulders. Imagine yourself in a beautiful place in nature (or be there physically!) Feel your feet on the ground, even connecting through whatever floor is between you and the ground. Close your eyes. Bring to mind something you feel grateful for, or that makes you smile. Let your breath roll gently, softly in and out, until you want to let go. This simple practice has lots of benefits. The active energies in your hands are connecting with the most powerful electromagnetic field of the body; that of the heart. The heart’s field radiates to every part of your body, supplying healing and restoration for whatever is out-of-synch. The heart chakra is the home of feeling one’s rightful place in the world and at home in one’s body. 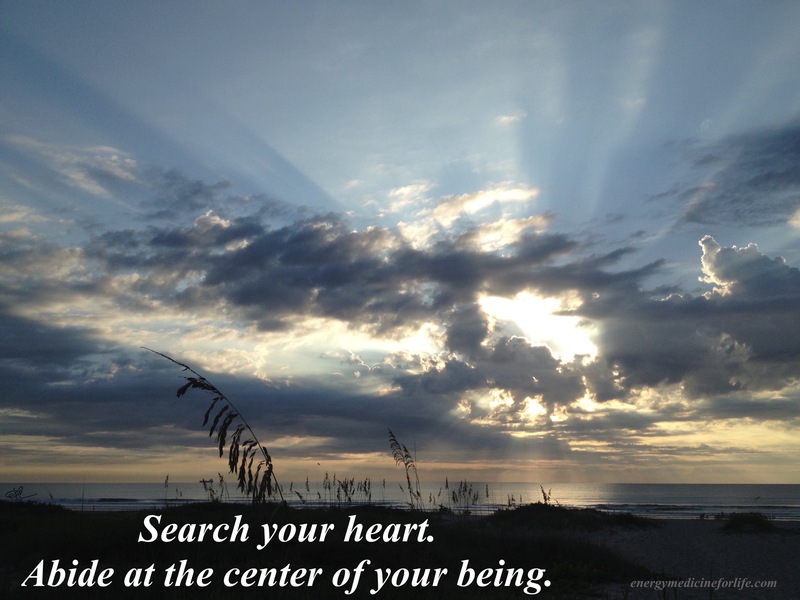 The center of the heart space opens to a connection with our essential selves, Spirit, Soul, where we can receive direct guidance for our earth-walk. Biochemically, a few minutes with our hands on our hearts, smiling and grateful, increases the amount of oxytocin in our blood stream: the feel-good, feeling-connected hormone that makes us feel we belong. Please enjoy this poem, and I wish you a deeply restored and peaceful heart. Some other time, it will out turn out. No one else has the answer. No other place will be better. It has already turned out. At the center of your being you have such answers. and you know what you want. Rather abide at the center of your being. and see the way to do is to be. Healing long-standing illness involves regular attention and repeated re-setting of energy patterns. 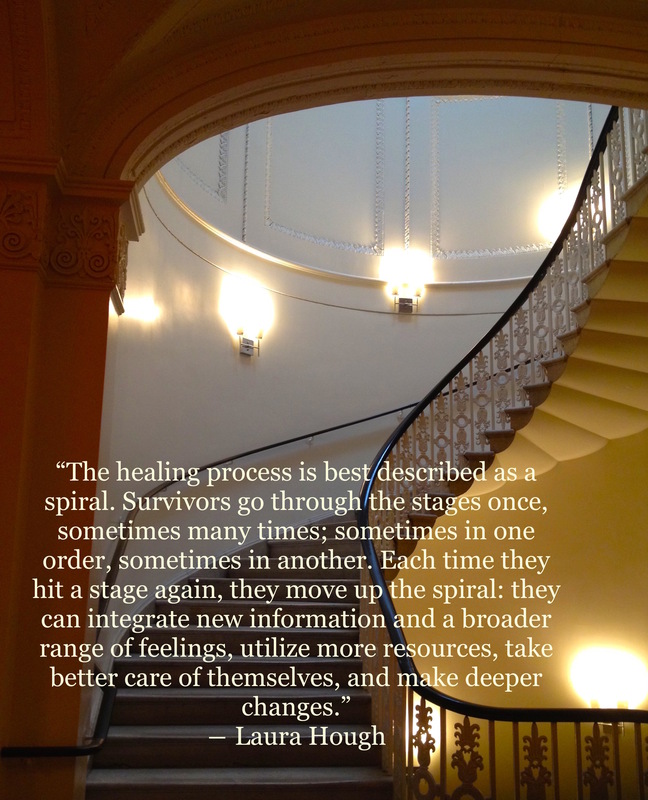 In this quote, Laura Hough refers to “survivors,” those who lived through severe trauma. But hers is such a realistic perspective of significant healing processes, not only the healing of trauma. When we look at our healing as an ongoing process, bringing healing up from our depths and meeting each piece as we go, we can release the frustrating idea that healing is like flipping off a switch. It helps us to notice what is better now, not just what is still not seeming right. Deep changes are funded by steadily rebuilding our resources from within. Stress has been associated with all the leading causes of death, including cardiovascular disease, cancer, accidents and suicide. About 90 percent of all visits to primary health care providers are considered stress-related. Nearly half of all adults suffer from adverse effects from stress. I like to change up the phrasing a bit, though. Stress is a normal part of life, both good stresses like going to a great party, and challenging stresses like dealing with a flat tire on the road. If we decide that “Life” is on our side, and choose to see the Universe as a friendly place, then we can stop seeing Stress as a constant danger to our health. Instead, we can look at all the inevitable stressors as *not* being the real problem; rather, the issue is how well we neutralize the effects of stress on our bodies, emotional life, and our thinking. 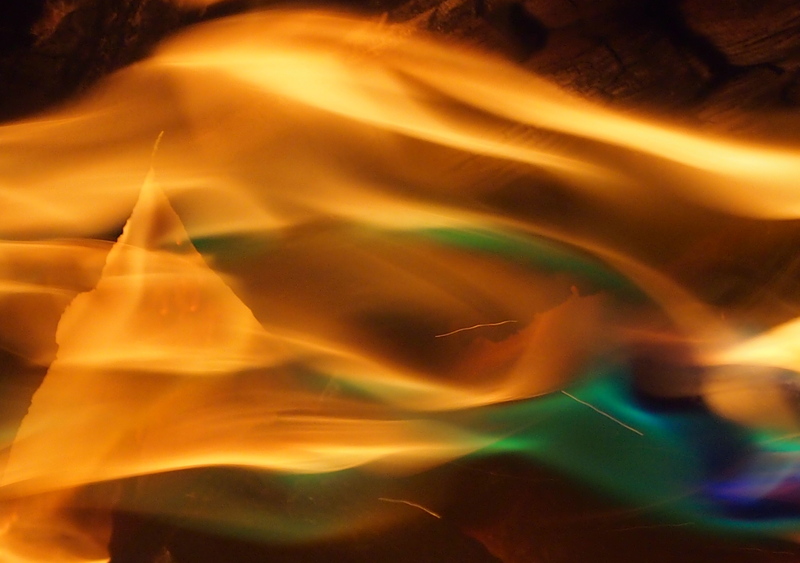 In Chinese Medicine, the name for the internal manager of our stress response, or the fight-or-flight reaction, is called Triple Warmer (or Triple Burner.) This energy system works valiantly to keep us safe and alive, and can become over-reactive to the levels of stress we live with. Few of us are taught holistic methods to turn off over-active stress responses, and our internal chemistry suffers from over-active adrenaline and cortisol. Meditation is a good de-stressing tool, as is mindful Yoga practice. The Mellow Mudra is a way that combines a Yoga hand mudra, mindful meditative breathing, and a way to engage the language of Energy that is built into your body to neutralize stress chemistry and break the cycle of stress. Use this technique freely and often; it is a great way to nip a stressful thought in the bud, and prevent subsequent stress reactions in the body and mind. See how to do The Mellow Mudra, on Prune Harris’ You Tube Channel. At the foundation of Energy Medicine is the understanding that we each have an inner healing force, an intelligent active inner physician. It’s the same force that heals your skin when you get a cut, fights off a cold, causes you to recover from the flu, and it does much, much more. The techniques you can learn through Eden Energy Medicine don’t teach your body anything new; they reactivate and restore healing from the resources already within you. And, they give you powerful ways to work with the energies of your own body to improve your health and well-being. Energy Medicine is not new; it has roots in traditional Chinese medicine (including Acupuncture and Five Elements systems), Tai Chi, and Yoga, which are each thousands of years old. However, energy healing is not yet widely used or recognized in our country. The trend of the times is to believe only what we have been able to measure, which also means that if we haven’t been clever enough to create a machine sensitive enough to register and quantify the subtle energy information around us, we tend to not believe it is there. He asked that question about 100 years ago. Now we have MRIs, PET scans and SQUID magnetometers. I think he would be impressed. Einstein’s legacy was to change the face of science, from viewing the universe from a Newtonian / mechanical perspective, to the perspective of “All is Energy.” He was a pioneer in quantum theory, and brought forward the understanding that everything we can touch is actually energy. In other words, Everything is Energy. Our bodies, our physical world, our thoughts and beliefs are all part of a resonant field of vibrating, oscillating energy. Our energy is affected by our lifestyles, our environment, and our emotions. The patterns of these energy fields can be influenced by specially targeted massage, movement exercises, tapping on key spots on the body, choosing new thought habits, and other methods. You can affect your energy fields with simple techniques, which will affect your health, your wellbeing, and your state of mind. Albert Einstein said, “The field is the sole governing agency of the particle.” In other words, the force of invisible energy, the information held in energy fields, is the only determinant of physical reality. You have the ability to restore your energy fields to healthier and more resilient patterns. This will then reflect in your mood, your sense of vitality, and your over all health. Although conventional medicine does not currently, generally, validate energy medicine, in the past twenty years there have been great strides in the documentation, measurement and observational evidence of energy healing. James Oschman, PhD, biologist and biophysicist, began his research into the field of energy medicine as a dispassionate skeptic, and became convinced of its validity almost in spite of himself. His first book is called Energy Medicine, The Scientific Basis. His latest book is Energy Medicine in Therapeutics and Human Performance Another interesting resource is by Richard Gerber, MD, called Vibrational Medicine. Want to try some energy exercises right now? Then I encourage you to visit Prune Harris’ site called Imaginal Health. She has created a lovely collection of videos to teach you how to take your self-care on a quantum leap, and help you move towards greater health and wellness. Lyn Milum, Eden Energy Medicine Clinical Practitioner, Licensed Massage Therapist (MA57728). 1. Place one hand between your breasts, and the other on the top of your head. 2. Bend your fingers so the back of the fingers rests on those places. 3. Alternate palm-side and back of fingers, back and forth, for 5 to 10 breaths. 4. With one hand, bring the tips of thumbs and first two fingers together. Rest the three fingertips of that hand on the top of your head, and rest your other palm between your breasts. 5. Breathe for 5 conscious breaths, or more. Invite the flow of the peace that lives within you. I love to engage with energy fields, partnering with another’s Inner Healer to help them find relief from pain, progress towards their intentions, and the expression of their natural, in-born Joy. Engaging the energy in person, with touch, offers such sweet qualities of comfort and grounding. The measurable electromagnetic fields of the body can be detected, and are altered when we physically interact. This awareness is becoming almost a main-stream understanding. Engaging the energy across thousands of miles, using the phone or internet or simply intention to connect, is a concept that is often more challenging to grasp. It pushes us to really own the fundamental basis of science itself: that Everything is Energy. Everything. Non-local energy work is fascinating. I facilitate the work for others, and enjoy been on the receiving end, and it always strikes me as profoundly impactful and awe-inspiring. It helps my clients to recognize that each of us is walking around with a personal expert inner healer that is nudging us towards wellness all the time. It also helps to recognize that we are always affecting each other … every kind word or generous action, every act of genuine attentiveness … contributes to our feeling better, feeling more connected and more alive. We are affected by the words and music we hear, by what we read and watch. Realizing that we sense an inner change, for better or worse, from conversations and media, helps to describe what goes on in non-local energy work. Words affect energy. Imagination changes energy. Consciousness and attention transforms energy. All things are composed of the same basic quantum material, vibrations of energy, which serve as an interconnecting force. It’s the quality of our interconnection that enables us to track energy states and invite change across distance. When attention and intention focuses on another, we Tune In with them, attuning our receptivity to become aware of the communications of their energy fields. Responsiveness to these energy communications, using the language of energy that the body “speaks,” catalyses healing, positive change, and deep wellness. Dr. Dossey suggests that since consciousness is non-local it therefore extends beyond the body. It can’t be confined to either a specific place such as a physical body, or a specific point in time such as the present moment. He also describes consciousness as an ordering principle. Consciousness, through attentive “tuning in,” reorganizes and restores balance, creating higher degrees of order by awakening the healthy impulses already present in the body. Tuning in on behalf of another’s wellness is part of an ongoing wave of Conscious Healing, whether it happens in someone’s physical presence, or from far away. When pain dissolves, or when I hear a client describe their inner state as buoyant, happy, calm and energized after our distance work, I feel so grateful. I am delighted to be a part of this wave. Summertime, annual height of heat, fire energies drawing upward and expanding. Our subtle energies respond and we enjoy the results of our responsiveness or we experience suffering. In Summer I often notice in myself and my clients patterns of migraines and other headaches, foggy thinking, anxiety, and a sense of a call for action coming from too many directions at once. Our elemental fire rises just as physical heat rises, which can direct a focus of excess energy to the upper body and the head. There is deep relief offered by seeking the balance of quiet grounding. Releasing energies caught in the top of the head by doing the Crown Pull is like opening the escape valve for steam in the pressure cooker of the body. Standing on cool wet grass in the shade in the early morning draws energies downward into a safe sense of grounding. Holding the Hook-Up points on the body for several minutes establishes stability and groundedness. Being well grounded in the physical body begins to relieve anxiety and clear the thinking. Grounding attunes us to our deep wellspring of elemental water below our feet, bringing a natural balance to our fire element. Water and Fire in elemental balance means that our Fire element does not become uncomfortably excessive. 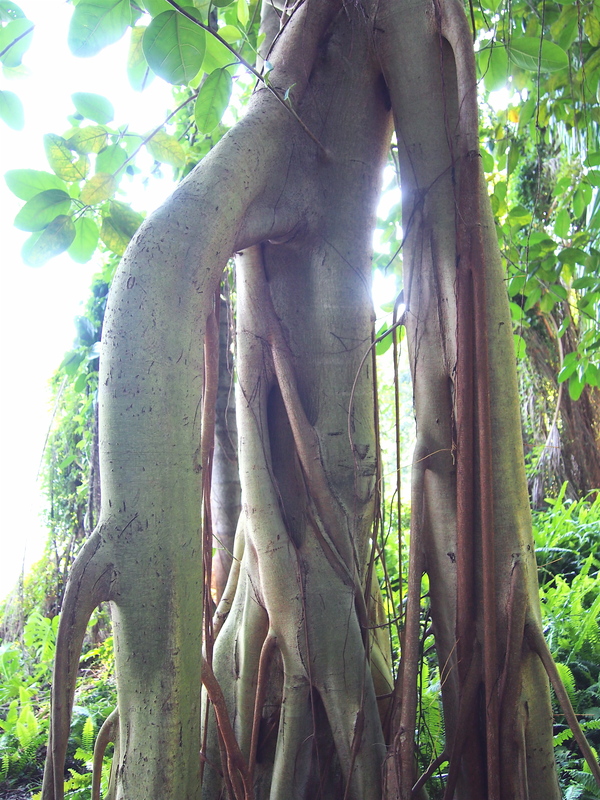 I love this image I took of a fig tree at Leu Gardens on Sunday. It shows such a lovely reaching gesture towards the quiet earth and towards the restorative waters beneath the surface. I feel today is an exceptionally excellent day to tend my auric field by expanding it (Fluffing the Aura), weaving it (the Celtic Weave exercise) and tracing figure 8s, large and small at the outer edge of my reach, side to side and up and down my waistline. Holding my Navel-to 3rd eye Hook Up connection for at least 5 minutes helps to ground my body energies and build integrity and resilience in my aura. I like to hum or tone while holding the Hook-Up; it feels like more inner connections are being restored. 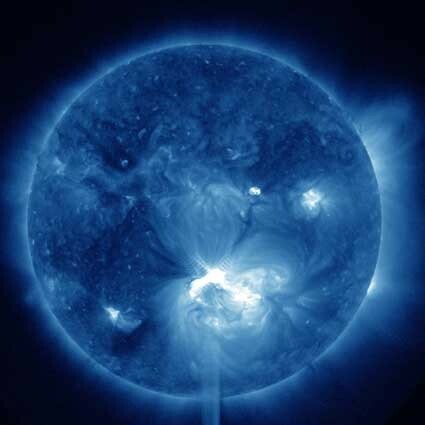 A large solar flare erupted today which has had a strong effect on communications in certain areas. The Earth’s “auric field” is its atmosphere, and as our bodies have synchronicity with the Earth, solar flares can affect our auras and other subtle energies. I started to feel quite oppressed in the balance of my energies about mid-day, but after about 10 minutes of restoring exercises, I’m back to myself again. “Fluffing the Aura” is an exercise I learned from Donna Eden. It resembles certain qi gong exercises. I use the electromagnetic field of my hands and begin by touching the floor near my feet, and slowly roll my hands in large circular patterns, as if rolling a round ball of energy from feet to head. I begin again at my feet and roll my hands up one side, and then the other, and then my back as well as I am able to reach it. Where I can’t reach my back, I use my imagination to expand and weave my bio-field’s integrity. This exercise has the effect of expanding the auric field, giving the subtle and electromagnetic energies of the body more room to communicate together and make the connections they need to make.